Cellist Ken James Kubota, celebrated by The New York Times for his "dynamic” and “polished” musicianship, has found unprecedented success in a career spanning performance, education, and social media. Kubota is known both for pioneering his unique style of strumming the cello like a guitar and also for his staggering success as the founder and producer of the viral video series JHM Jams, described in National Sawdust Log as an “online powerhouse.” The JHM series consists of bi-weekly videos of unique pop arrangements performed by a rotating cast of elite classical and jazz musicians. Also found on Facebook and Instagram, the series has racked up over 3,000,000 YouTube views since its 2016 debut, and has been recognized by Glamour, The Violin Channel, The Strad, Classic FM, and entertainment studio Lionsgate, along with stars like Demi Lovato, Charlie Puth, and the Chainsmokers, among many others. Kubota is proud to use the JHM brand to bring its members high-profile performance opportunities, including as musicians for nationally recognized real estate broker Kimberly Hastie at Halstead Property. In his personal career, Mr. Kubota leapt onto the public eye as a featured performer on NPR’s From The Top in 2008. Since then, the cellist has graced stages across the United States, Japan, France, and Switzerland, including Alice Tully Hall in New York, Orchestra Hall in Detroit, Shiodome and Keyaki Hall in Tokyo, Guggenheim House and Prokofiev Hall in Kobe, and Petite Elle Studio in Osaka, among many others. Mr. Kubota’s love for chamber music has taken him to prestigious festivals across the world, including the inaugural Encore Chamber Music String Quartet Intensive, Madeline Island Music Camp, Caroga Lake Music Festival, The Creative Cello Summit, Icicle Creek Chamber Music Festival, Blossom Music Festival, Chautauqua Music Festival, The Quartet Program, and Meadowmount School of Music. 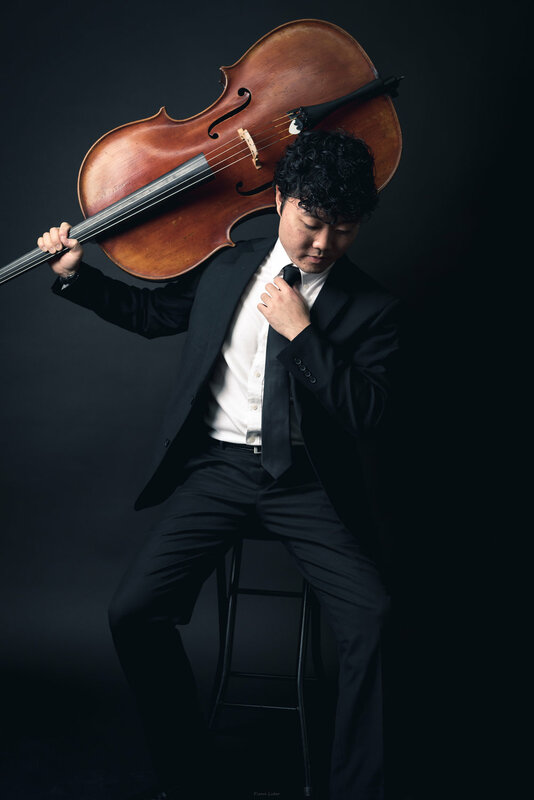 Further, Kubota served as the principal cellist in the Juilliard Chamber Orchestra, and performed in the ChamberFest intensive at Juilliard for four years. World-class coaches have taken notice of Kubota’s success and growth in chamber music, leading to collaborations with members of the Guarneri, Juilliard, Cleveland, Emerson, Cavani, and St. Lawrence String Quartets. In 2018, Kubota formed Empire Wild, a band with cellist Mitch Lyon and percussionist/singer Brandon Ilaw, in which the trio perform their own original music. After a successful Kickstarter campaign raising over $4700, the band will be releasing their first EP in 2019. Mr. Kubota began his cello studies at the age of 8 in Columbus, Ohio. A believer in educating younger generations, he has spoken to Juilliard students as an authority on entrepreneurship. Kubota has held a private teaching studio since 2007 and led a master class at College of Mount St. Joseph. He currently teaches at the Peabody Preparatory under Johns Hopkins University, Suzuki Music Schools of Westport and Orange in Connecticut, and Lucy Moses School in NYC. Mr. Kubota holds a Bachelor of Music and Master of Music degree from The Juilliard School. He counts Richard Aaron, Anthony Elliott, and Alice Ann O’Neill among his primary teachers and mentors. Among others who have whispered to him ancient secrets of cello and music are Yo-Yo Ma, Frans Helmerson, and Peter Stumpf. Follow and listen to his journey on Instagram and YouTube at @kkubota8 and on the hashtag #JHMJams.